Motivational Quotes on Aesop:- Aesop was a Greek fabulist and storyteller credited with a number of fables now collectively known as Aesop’s Fables. Although his existence remains unclear and no writings by him survive, numerous tales credited to him were gathered across the centuries and in many languages in a storytelling tradition. 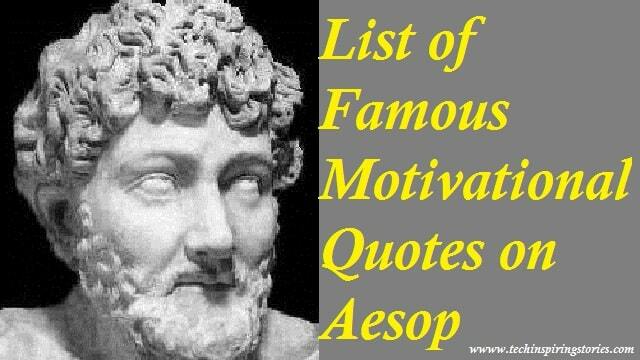 Aesop is believed to have been alive from 620 to 560 BC. It was believed that he was a slave, but was given his freedom because of his literacy and storytelling. He is also described with many physical deformities and a speech impediment that was healed by a deity. Aesop was said to have escaped punishment many times throughout his life, often standing up to his accusers and telling a story that showed the irony or the characteristics of those punishing him. His death is just as much of a mystery as his life. It is believed that he stole a gold or silver cup and was violently put to death by being thrown off a cliff.